Think of it as mathematics with a bite: Researchers at CU Boulder have uncovered the statistical rules that govern how gigantic colonies of fire ants form bridges, ladders and floating rafts. The research, published last week in the Journal of the Royal Society Interface, takes a unique look at one of the strangest, and potentially painful, networks in nature. Fire ants (Solenopsis invicta) are resourceful builders, using their own bodies to create gigantic structures made up of hundreds to thousands of insects and more. In the new study, a team led by CU Boulder's Franck Vernerey set out to lay out the engineering principles that underlie these all-ant structures—specifically, how they become so flexible, changing their shapes and consistencies within seconds. The group used statistical mechanics to calculate the way that ant colonies respond to stresses from the outside, shifting how they hang onto their neighbors based on key thresholds. The findings may also help researchers understand other "dynamic networks" in nature, including cells in the human body, said Vernerey, an associate professor in the Department of Mechanical Engineering. Such networks "are why human bodies can self-heal," Vernerey said. "They are why we can grow. All of this is because we are made from materials that are interacting and can change their shape over time." 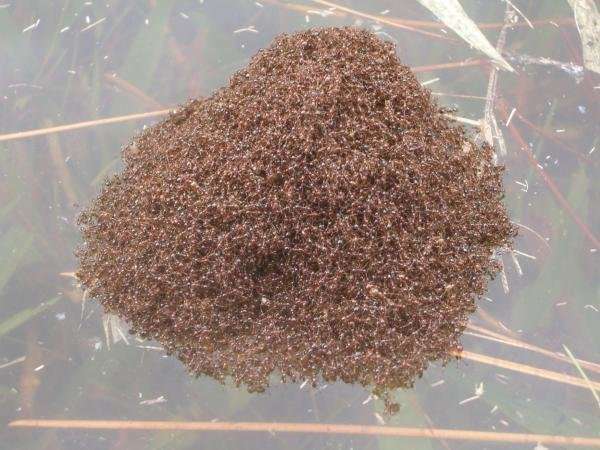 They can also float: Fire ant colonies gained some fame in 2017 when videos from the aftermath of Hurricane Harvey in Texas showed these insects riding out the flood waters by banding together into rafts. Such structures may be an insectophobe's nightmare, but they're an engineer's dream. That's because while individual ants have simple brains, their colonies display surprisingly intelligent behavior. That's a trait that scientists would like to mimic as they develop new types of polymers and swarms of robots that can work together seamlessly. Fire ants are "a bio-inspiration," said Shankar Lalitha Sridhar, a graduate student in mechanical engineering at CU Boulder and a coauthor of the new study. The goal is "to mimic what they do by figuring out the rules." To begin to understand those rules, the team turned to experimental results collected by scientists at Georgia Tech University. Those researchers found that fire ant colonies maintain their flexibility through a fast-paced dance. To glom onto each other, individual ants hang onto the insects next to them using the sticky pads on their feet. But they also don't stay still: In a typical colony, those ants may shift the position of their feet, grabbing onto a different neighbor every 0.7 seconds. The team from CU Boulder wanted to find out how the ants govern this internal cha-cha in response to outside pressures. To do that, Vernerey and his colleagues used a mathematical tool that allowed them to average out the behavior of the hundreds to thousands of ants in a colony. "When look at an aggregation, you don't really care what one ant does," said Tong Shen, a graduate student in mechanical engineering and a coauthor of the study. "You just look at the population." The researchers, who also included graduate student Robert Wagner, discovered that as the forces on ant colonies increase, the insects pick up their speed. If the force on an individual ant's leg hits more than eight times its body weight, the insect will compensate by switching between its neighbors twice as fast. "If you start to increase your rate of shear, then you will start stretching their legs a little bit," Vernerey said. "Their reaction will be, 'oh, we are being stretched here, so let's exchange our turnover rate.'" That behavior explains why ant colonies are classified as "shear-thinning" fluids, or materials that get thinner the more force you put on them—think stirring a can of paint. But if you keep increasing the forces on the ants, they can no longer keep up. When that happens, the ants will stop letting go of their neighbors and instead hold on for dear life. "Now, they will be so stressed that they will behave like a solid," Vernerey said. "Then at some point you just break them." 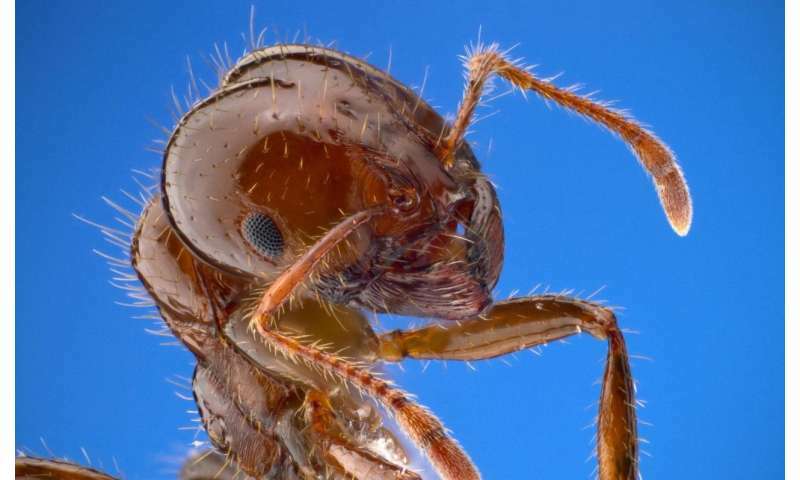 The researchers explained that they've only just scratched the surface of the mathematics of fire ant colonies. But their calculations are general enough that researchers can already begin using them to explore designs for new dynamic networks, including molecular machines that deliver drugs directly to cells.